discrimination on the basis of race, color, national origin, sexual orientation, religion, age, disability, marital or family status. The pavement reclaiming process for Cedar, Pine, Linden and Highland streets will begin on April 23, 2019. The pavement will be removed and any remaining material will be graded and then compacted with water to enable safe travel. There will be signs and flaggers in place to help you navigate the job site. This shouldn't last more than two days. Following this phase of the project, the roads will be left unpaved so that the utility companies will be able to make any necessary repairs to their systems, if needed. The next phase of the project will be application of a base layer of asphalt. We expect this phase of the project will be completed by the fall, possibly sooner. The final phase of the project will be application of the top layer of asphalt in the spring of 2020. Thank you for your patience as we work to improve our roads! Public Works Director, Kevin Duval at 603-286-4721. Saturday, April 20th is the Town Wide Yard Sale - participating address are noted on the attached map. If you observe an issue you think might be a violation of our Zoning ordinance, or some building activity that may not have proper permits in place, please complete the following form. This is a one way notification, it will be logged and investigated. There will be no reporting back to the submitter. We appreciate your help in reporting suspect items. Old Home day is right around the corner - Saturday, June 29th! Now is the time to register for the parade and booth. Please use the following forms to apply to be in the parade, or to reserve a booth. The theme this year is: Tilton-Northfield Old Home Day Celebrates Birthdays Throughout our Communities. Don't delay in registering! Avitar Associates, Tilton's assessors will be around town this week doing field work for the 2019 town-wide revaluation. Their vehicles are clearly marked as Avitar and the two people doing the work, Loren and Jonathan both have proper identification. Would you like your family story be included in the Tilton Time Capsule? Tilton's Birthday is this year!! We are celebrating 150 years with a number of festivities. A Time Capsule will be buried on June 30, 2019 to be opened in 50 years at the Riverfront Park. Imagine in 50 years Tilton will be celebrating its 200th Birthday. If you would like to be included please email Cindy Reinartz, Tilton's 150th Celebration Committee Member at tctc@tiltonnh.org with your name and contact information. Deadline to be included in the capsule will be May 8th when Cindy will randomly pull out 3 names. How many children (if any) with names and ages. What would you like to tell those persons opening the capsule in 50 years. Full time year round position with benefits. Possession of valid NH Driver's license and CDL-B with air brakes and manual transmission experience required. Previous municipal plowing experience preferred. Successful candidate will be subject to pre-employment physical, drug/alcohol screening and background check. The position is physically demanding; must be willing to work under adverse weather conditions, as well as nights and weekends when necessary. Wage depending upon experience. Application and job description are available in the Selectmen's Office, 257 Main Street, Tilton, NH 03276. For further information contact Kevin Duval, Director of Public Works 603-286-4721. The Town of Tilton is an EOE employer. The Town Planner performs highly responsible administrative and professional duties in directing the operations of the Land Use Office which includes the functions of the Planning Board, Zoning Board, and Code Enforcement. Planner will provide organizational assistance to the Town's Assessor. Serves as primary contact with the general public and Town Departments concerning land use matters. Provides assistance with community planning and community development projects. Performs all other duties as assigned by the Planning, Zoning, and Selectboard. Candidates should have a thorough knowledge of local government in New Hampshire and the ability to plan, organize, and coordinate a broad range of functions. Full time position with excellent benefits. Salary commensurate with experience. Please see the Jobs page for more information including job description and how to apply. 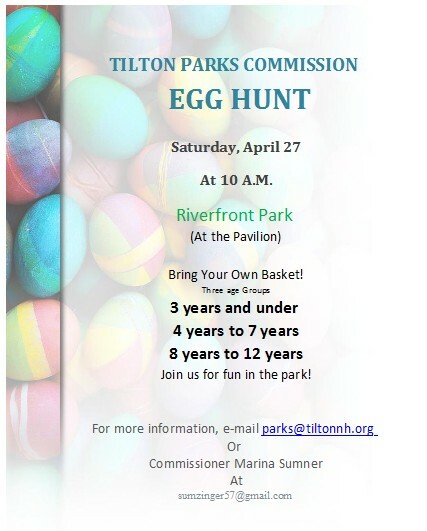 Tilton Residents only. Wednesday, April 24 - 26 from 9am to 3:30pm - Saturday, April 27th 8:30am to 4pm. Must have a dump sticker, which can be obtained from the Town Clerk's Office. Saturday, April 20th. Sign up at Town Hall - FREE - to list your address on the map. Deadline to register is Thursday, April 18th. Any questions call 286-4521 ext 100. The Tilton Board of Selectmen held a public forum on Thursday, March 21st, and received public comment at that time and answered questions about the upcoming revaluation of Tilton properties. See frequently asked questions document and information on the 2019 update. Representatives from Avitar Assessing discussed the purpose and process of the 2019 revaluation and were on hand to answer questions from Tilton property owners. Replay this section of the public hearing. The Town of Tilton 2018 tax rate was set at $24.85 (used for the 2nd tax bill of 2018 and the 1st estimated tax bill of 2019). No unassigned fund balance was used to lower the rate. There's a tax rate guide available to help citizens learn how the tax rate is calculated. Reminder to All Dog Owners - The Town of Tilton has an Ordinance! Clean up after your Dog on any public property, streets, alleys, sidewalks, parks or any other public grounds or any private property, other than the premises of the owner or person having custody of said dog. Any person violating the ordinance shall be fined $25.00 for the first offense and $50.00 for the second offense, any subsequent offense will be marked must appear and will be determined at court, not including any penalty assessment assigned by the Court. The following schedule shows when the assessor will be in Town Hall. Zoning Regulation 10.4 requires new businesses coming into town to register their business and to obtain a Certificate of Occupancy prior to opening the business. All existing businesses must also have their business registered with the Town. Please use the attached form for registering your business. Per RSA 540:1, the following affidavit is required to be filed with the Town Clerk. There is a fee of $20.00 per affidavit.